International style reigns: The Liberation of Paris Vibrant, young, adventurous, international chef shake it up (in glamorous slides from the New York Times). 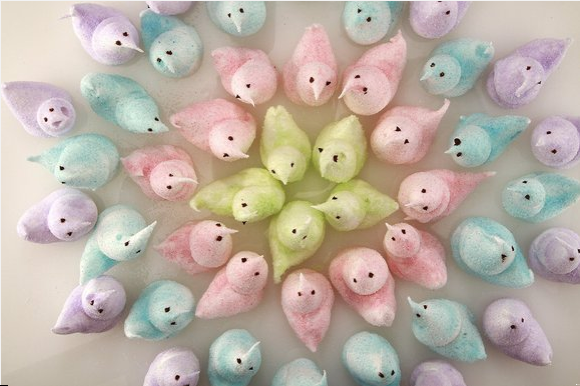 Getting the Shot: Food Photography 101 from the LA Times (source of the peeps, above). Feast your eyes on some Beer and Cheese pairings, photographed so beautifully we want to live there. View the other worldly Vanishing Spirits: The Dried Remains of Single Malt Scotch "'After first noticing the patterns left behind in his glass, Button began experimenting with other Scotch residues, shining different colored lights on them and photographing them up close. The results were strangely beautiful. 'A little celestial, or extraterrestrial, almost,' says Button."